Yes, I know I’ve been a bit slack lately with this, but I have my Weak Auras mostly finished. There are a few tweaks I want to make, but they can wait. One word of warning for non-English users: everything uses spell names rather than spell IDs at this stage. If I get some time I’ll try converting it over to IDs where possible. Important! There is now a flashy lightning “animation” over the center bar. This is the extra ES 20 warning, and is two copies of a custom texture extracted from the game & fixed up by Steven Eson. You need to download this and put it into a ICONS folder in your World of Warcraft\Interface directory (eg: G:\World of Warcraft\Interface\ICONS). To the left & right are my standard Lava Burst auras, and in the middle are some reminders for Lightning Shield, Searing Totem, and Augment Rune. The fun stuff is the section at the bottom. Starting on the left we have a Flame Shock icon. This will show when Flame Shock is on the target, with a green border when under 9 seconds remaining (if you have Core of the Primal Elements I’d recommend changing this to your FS duration * 0.3) and now with new functionality the Unleash Flame or Elemental Fusion icons will show if one or both were used on the current Flame Shock cast, thanks to LUA work from Pawkets. It won’t show if you have 1 or 2 Fusion charges applied, but it’ll be a good indicator of when you can refresh early. The icon under Flame Shock on the left is Earthquake, and will show either the Echo charge refresh or the cooldown, along with Enhanced Chain Lightning as the border glow effect (ie: it’s buffed & instant cast). The central bar that goes blue -> yellow -> green -> red is my Lightning Shield tracker. Green is the ideal cast range, as is yellow if you have T17 4pc otherwise it’s the “get ready” area. Red indicates you’re capped out, and I’ve added a lightning bar behind it for this as well to make it more apparent (if I can trim the bars at each end of the texture I’ll put a better version of this in). Lastly, the background shows the shock cooldown as a red bar. On the right we have a Lava Burst cooldown timer, with the Ascendance timer underneath it. 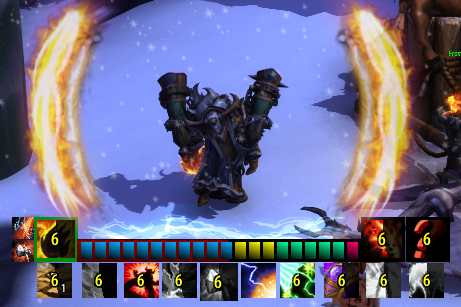 The outer right icons are a Fire Totem tracker (the question mark) and a Fire Elemental tracker. The Legendary Ring tracker is to the left of Ascendance (and glows when it’s up). The icons in the middle from left to right are: Astral Shift/Stone Bulwark Totem, Shamanistic Rage, L100 tracker (Storm Elemental, Liquid Magma, Elemental Fusion charges), Unleash Flame, L60 tracker (Elemental Mastery & Ancestral Swiftness) & Spiritwalker’s Grace. As an added bonus there is now a “mini totem tracker” which dynamically displays cooldowns for all those other totems you have. Includes: Capacitor, Earthbind/Earthgrab, Grounding, Healing Stream, Tremor, Windwalk. Why so many links? Turns out loading many hundreds of Kb of WA strings disconnects some people, so I have to split some of the groups up. The idea here is not to change much, because the rotation mostly works as is. Removing Lava Burst as a source of Lightning Shield charges removes that awkward ES20 during Ascendance situation, which is exacerbated at the moment via T18 2pc. The removal of Lava Surge is to allow more changes for mobile DPS, but also to make Lava Burst more of a managed resource than a “hit button now” ability. This will also make Elemental Fusion a bit more engaging as we’ll be able to directly manage it. The charge refresh rate for Lava Burst could be reduced from 8 to 6-7 seconds to balance out the Surge removal too. Changing Molten Earth to be a direct spell proc rather than a “ranged auto attack” means that it’s a direct % increase to virtually all spells, and will scale reasonably well with all other stats rather than being something we want to avoid. It would trigger from all direct damage casts, and also increase Earthquake damage by the same percentage. The only things it wouldn’t trigger from would be Flame Shock ticks, Fulmination procs and Chain Lighting secondary hits. It would also repeat crits & multistrikes without having its own change to independently generate these. With 2 shock charges you can decide how to use them. Should a priority target come up it’ll allow us to go FS -> LvB -> ES15 if we so wish. Reducing the bonus Lava Burst damage off Flame Shock also means that it’s not quite optimal to use Lava Burst without Flame Shock on the target, rather than being very un-optimal, while still leaving some spell interaction there. We’re mostly fine here, although I’d remove Echo so that Earthquake wasn’t quite so abusable, but change the damage mechanic so it hit hard at the start & decreases over time in a similar manner to Execution Sentence. The CL glyph would be removed mostly because it’s good sometimes and bad in others. CL jump range would be increased a bit so that it’s easier to cleave. Here’s where the big changes are. First off, Molten Earth is now a proc directly off casts, not a ranged “auto attack”. To fill the void, Earth Shock won’t consume charges if it doesn’t trigger Fulmination, so there is an easy to use mobile filler to use. This would return some of the “difficulty factor” back to Shock management, but only in the case where if you need to move without SWG you’ll need to be prepared & manage shock charges for it. There are many changes needed here, but I’ll only cover some of the tiers. L45: Make Totemic Projection a component of totems that require it, otherwise remove all three talents. In their place have 3 centered around Ghost Wolf: One makes it twice as fast but on a short duration/cooldown to effectively cover the same distance on average, second allows instant cast spells (not weapon based abilities) while in Ghost Wolf, third is a low level movement speed passive. L60/90/100: Re-arrange & remove some of these. This would make some of the choices less definitive, and allow some basic assumptions to be made. Rotation Changes: Elemental Blast would be changed to be the same damage/effects as Lightning Bolt with 2 charges. The primary reason for the spell would be the buff it generates, but as the buff would last for 10 seconds and charges would refresh every 15, you’d only be able to keep it up for ~2/3rds of the time. Acts as a heal/healing buff for Restoration. It’s kind of merging the behaviour of Elemental Blast & Unleashed Fury together, but since Unleash Flame is being removed keeping Unleashed Fury doesn’t quite make sense. Having this on the same level as Elemental Fusion also makes sense, as with the changes to Lava Burst you’ll be adjusting your rotation somehow to account for it. Cooldowns: Making EM, PE & SE all part of the same level means you either get a short self buff, a better pet cooldown, or a second pet cooldown. Would also remove the need for utility interaction between PE & SE as you won’t be able to have both at once (and tbh, Primal Storm Elemental has virtually no advantages & some potential downsides). I’d argue that most totems need to go, and some of the abilities converted to being centred around the player. With the new “self ability” versions, Stone Bulwark would just be a self buff that generates shields in a similar manner to how it works now, but hopefully in a way that scales properly as other shields do. Grounding, on the other hand, would allow you to redirect a spell to yourself (or act as a spell reflect with a major glyph), which you could combine with Stoneskin (one of the new abilities mentioned below) to absorb/immune rather than taking the damage. Stoneskin: completely absorbs damaging attacks, but breaks after taking X damage. Assuming immunity type abilities remain, like Ice Block, this will be the Elemental answer. Can absorb one massive hit, or lots of little ones before breaking. The cooldown would be a bit longer than Shamanistic Rage, perhaps 2-3 minutes, with a 10-15 second duration. It won’t be able to prevent you from being debuffed or completely nullify damaging abilities like other abilities can, so the cooldown can be a little lower without being too overpowered. Earthen Grasp: Replacing Hex, this would be a molten hand that rises from the ground, grasping the target and acting as a CC. It’d be in a similar category to Polymorph for PvP purposes, and be able to affect any enemy type in PvP. No cooldown, breaks when taking damage, only one target at a time. The idea here is to add more “earthy” stuff in (while removing voodoo/spirit stuff that doesn’t quite fit the Elemental theme) while also making Elemental CC a bit more practical for PvE. There are areas I haven’t covered, like the L15/30/75 talents, mostly because I’m not entirely sure what to change there, if anything needs changing. I’d say that L75 needs to be completely removed, or the talents mixed into other levels so that you have a choice between throughput or a bit of off-healing, but balancing that may be moderately impossible. In general I don’t think Elemental needs a massive overhaul, but rather just a few tweaks to make what we currently have better, while retaining most of the challenging factors in the rotation. More words will go here later, but if you’re following me on twitter you’ll have seen my thought about using focus macros to get Lava Burst into a Flame Shocked target, while casting Lightning Bolt & Earth Shock on secondary targets. Sets a focus if it doesn’t exist, and then casts Flame Shock on that target. Casts Lava Burst on your Focus target, or whatever target you have if you don’t have a focus. One other macro should say /clearfocus to well, clear your focus target. Obviously you’ll need two Flame Shock buttons, one for normal dotting and one for focus targetting (which still lets you use any focus Wind Shear/Purge/Hex macros should you have them). Given that Hellfire Citadel is the “last” raid instance of Warlords of Draenor (quotes because I wouldn’t be surprised at a Ruby Sanctum style instance being released if the next expansion is too far away) it means we’ll probably see a new expansion announced at Blizzcon with a release of maybe April 2016 (taking a guess at this). This means now is a good time to start looking at your class/spec and thinking about posting some decent feedback. I did say “decent feedback” there, which is important. Often on the forums/twitter/elsewhere there will be feedback posts saying that “X is a problem” or “Y is a problem, here’s my proposed solution”. The issue with posts like these is there is usually not enough information in them to actually highlight what the issue is, often skipping over that to focus on the users favourite solution which in some cases will be either impractical or overpowered. Going back to the basics for a bit, in Journalism there are the “Five W’s” of Who, What, When, Where & Why (How also gets added into this set). The important questions to answer for feedback tends to be a series of What, When & Why, ie: What is the problem, Where does it happen, Why is it a problem. Who is generally the class or spec in question, When is largely irrelevant here, and How (as in, How to fix it) should be a footnote at the end or left out entirely rather than being the key focus of the post. A bad post would look something like this: “Elemental target switching is horrible. You should unlink the shock cooldowns to fix this!”. It briefly highlights a problem (and in this case it is a valid problem) but doesn’t explain why it is an issue. The suggested solution is also a bit iffy, as managing the shock cooldowns has been previously mentioned as a “difficulty point” for Elemental players to manage. “Elemental has significant problems when it comes to rapid target switching. This is because of the shared Shock cooldown making it impossible to use Earth Shock to discharge a high stack of Lightning Shield charges on a new target while also debuffing the target with Flame Shock to gain additional Lava Burst damage. In most cases, the best damage approach to short lived targets (10 seconds or less) is to simply ignore fire spells and focus entirely on Lightning Bolt & Earth Shock. Alternatively Chain Lightning can be used to cleave secondary targets down, but this is only useful when the new target doesn’t need to die as soon as possible. The reason for ignoring Fire spells is that Lava Burst is best used when Flame Shock is on the target, to the point where delaying it for 5 seconds so Flame Shock can be cast is still a better damage option. The first paragraph highlights the problem, and then explains why it is an issue in detail. Usually this would be sufficient for a feedback post, but because I know a lot about Elemental I’m able to discuss potential solutions and why they may or may not resolve the problem. It’s important to remember that there are many intentional design choices made by the Developers, so some potential solutions may run counter to their design intentions. Everyone working on WoW wants you to enjoy the game, and in many cases would love to add in, fix or change everything to be exactly what everyone wants. The problem is that there is a finite amount of resources available to build the game with, and throwing additional people at the problem won’t solve it any faster (I’d guess that there’s some critical point where additional people may actually slow the process down). There’s also the fact that everyone playing the game wants different things, so it’s not going to be possible to please everyone. So please remember to be polite. Everyone wants WoW to be an awesome game, so lets work together to do this.